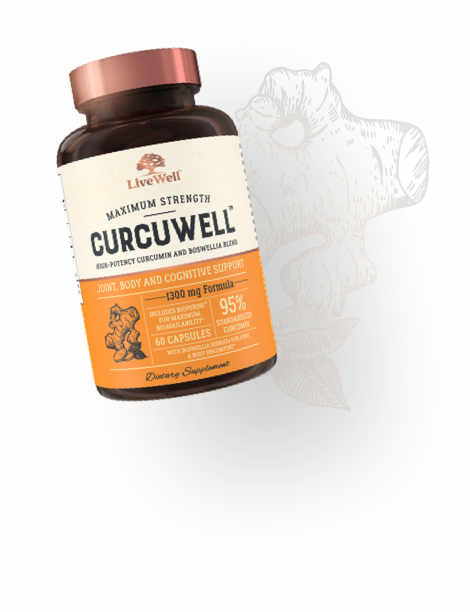 CurcuWell™ combines a potent 1000 mg daily dose of clinically proven 95% Curcuminoid Turmeric Curcumin extract and a 300 mg serving of 65% boswellic Boswellia Serrata with patented BioPerine® black pepper extract, clinically proven to increase absorption by up to 2000%. This powerful formula works to relieve joint discomfort, boost brain and heart function, and support systemic, full body health, so you can live well. support systemic full body health, so you can live well. An antioxidant powerhouse, turmeric curcumin has been clinically proven to support joint, heart, and brain function. 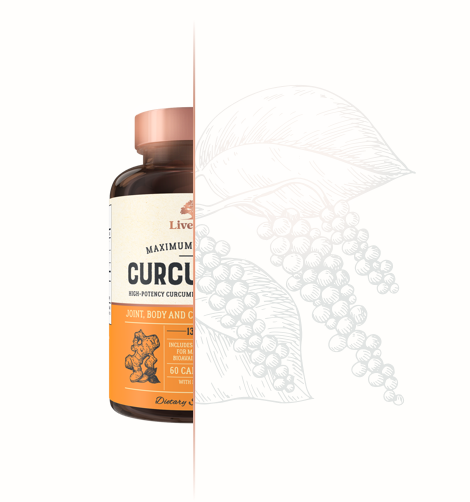 CurcuWell is packed with high-potency 95% standardized curcuminoids, 65% boswellic Boswellia Serrata, and patented black pepper extract BioPerine scientifically shown to increase absorption by up to 2000%, making CurcuWell more effective than any generic turmeric extract on the market today. This powerful clinically proven combination of turmeric curcumin with boswellia serrata, and Bioperine was designed to increase the beneficial effects of these ancient herbs, helping to ease joint discomfort and distress, while also encouraging the wellbeing of the brain, heart, and immune system, giving a boost your overall health.